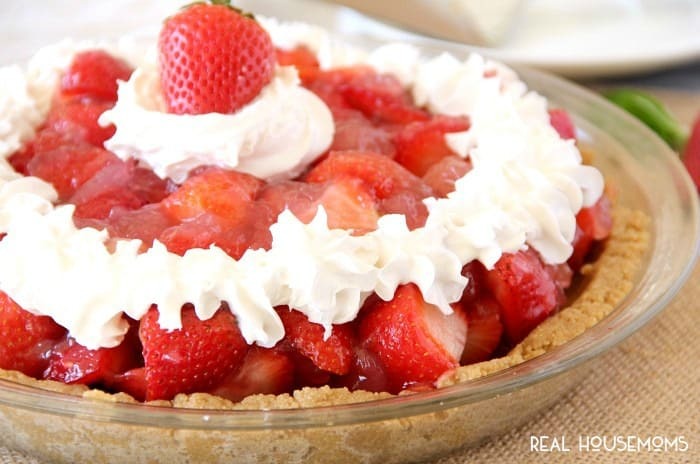 Summer picnics aren’t complete without this EASY STRAWBERRY PIE recipe! Since this pie isn’t baked, it’s best to use the best possible FRESH strawberries…frozen berries just won’t do in this recipe. So it’s best to reserve this no-bake pie for spring and summer when strawberries are perfectly ripe. I like to make my own graham cracker crust, but if you’re pressed for time or just really don’t want to worry about your serving ware, swap out a pre-made crust in a tin foil pan. Honestly, if I’m taking this pie to a picnic, potluck, or to a friend I love not having to worry about getting my expensive pie dish back. It’s just easier that way. This pie can easily be made with all sorts of different berries or combination of berries for other easy pie options. There really isn’t any berry that wouldn’t work and it gives you so much flexibility. If someone is allergic to strawberries, then just use an equal amount of a different berry. Super easy! Of course, feel free to swap out the jello flavor as well. The recipe is very forgiving. When I say this pie is easy, I mean easy. My 11 year old daughter jumped in the kitchen with me and made her own version of this pie all by herself and then took it to her friend’s house for dessert one evening. She opted to spread whipped cream over the entire top of the pie instead of cute little star bursts of whipped cream. 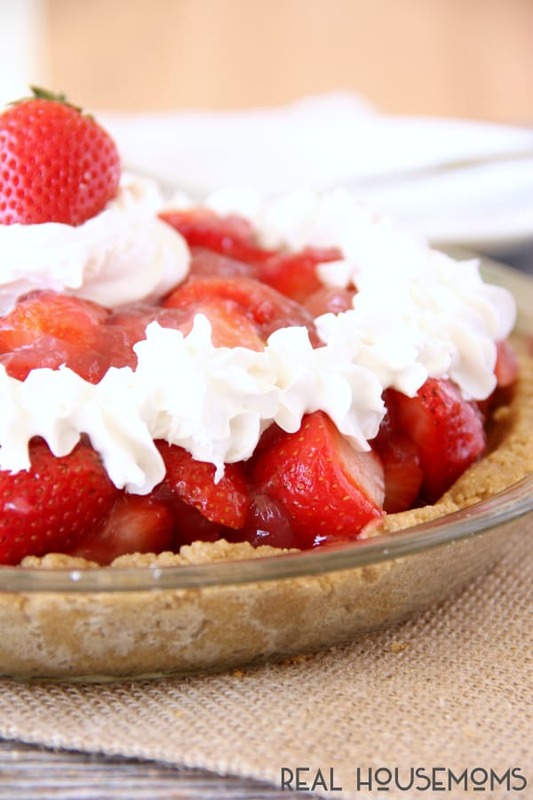 A big slice of this easy Strawberry Pie is just what you need on Memorial Day or the 4th of July. It’s delicious and everyone will love it. Pop over to Around My Family Table for more delicious HOLIDAY PIE RECIPES, like my Bacon Bourbon Chocolate Pecan Pie. 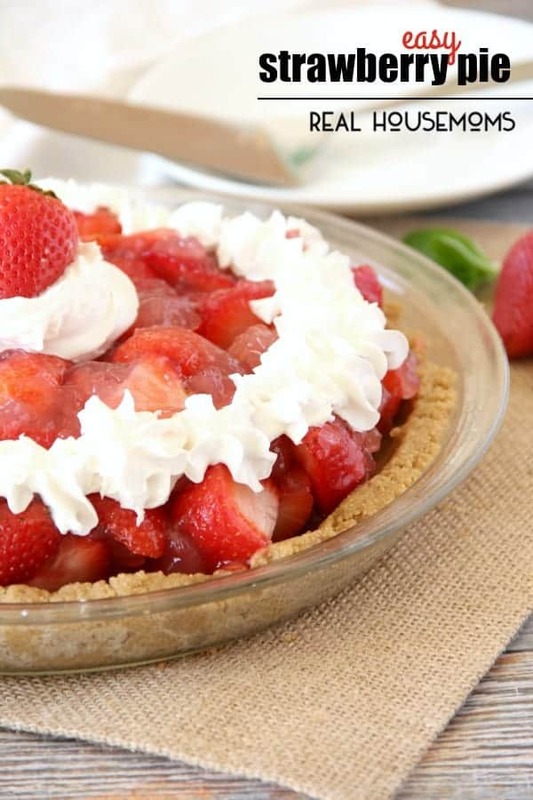 Summer picnics aren't complete without this EASY STRAWBERRY PIE recipe. Mix the graham cracker crumbs, melted butter, and 1/3 cup sugar together in a medium bowl until combined. The mixture will be coarse and sandy. Press the mixture into the bottom of 9 inch pie pan and slightly up the sides. Use the bottom of a flat cup to really press the crumbs into the pan. The crust should be really thick. Chill the crust for at least 2 hours before using. Mix water, 1/2 cup sugar, and cornstarch in medium saucepan. Bring to a boil over medium heat, stirring constantly. Boil and stir 1 minute then remove from heat. Stir in gelatin until dissolved. Refrigerate about 15-20 minutes, stirring occasionally, until mixture thickens, but isn't set. Fold strawberries gently into gelatin mixture. Pour into crust and refrigerate at least 2 hours or until set. Serve with whipped cream. Store leftovers covered in the refrigerator. To save time, you can also use a pre-made, ready-to-use graham cracker or shortbread pie crust.